A friend asked me, “Why would you enter a 100-mile ultramarathon? It just seems so outlandish for an otherwise rational thinking person to wish to endure such torture.” My answer was long and he seemed to understand when I was finished. I have trained long miles, ran hills, hiked and trekked, maintained a healthy diet, read vast amounts of literature on the topic, fantasized abount completing impossible endeavors, and then the day arrived and I began my personal assault on the Mount Everest in my soul. It is my soul that I am searching for out there in the midst of what you called torture. The run/trek begins with weeks of anticipation, downright intimidation at times because I am well aware of what I have signed up for. 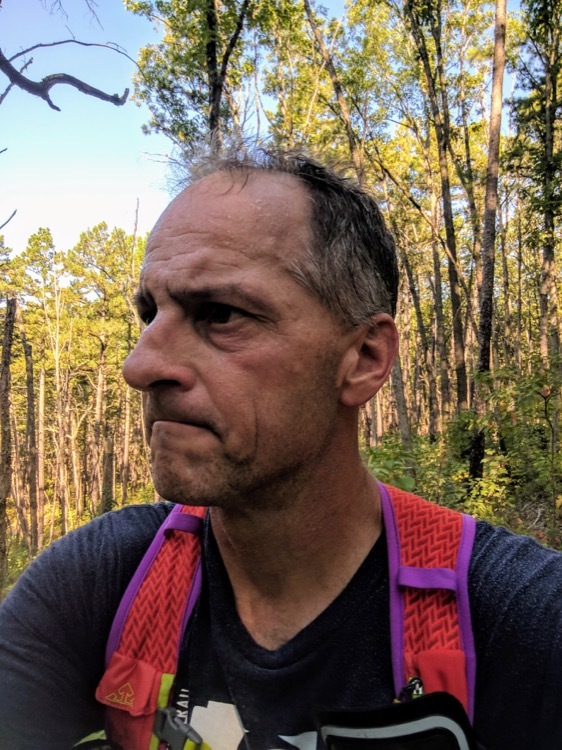 This particular ultra is the Mark Twain 100 on trails of rocks and roots that gradually shred feet, and with the added element of heat this year, I can be sure of further adversities. The nights leading up to it were sleepless. I read books on climbing Everest and the polar expedition of Shackleton. I forced myself to finish it in advance in case I would try quitting while in the throes of pain out there on the trail. The night before, I camped in my truck, photographed the night sky and slept horribly. At 6 a.m. the heat was already obvious and when the event started I felt a sudden release of anxiety. The trail was brutal: short steps, rocks always present, a root there and a high step over more rocks until it adds up and begins to deposit pain in your bank. At mile 30 I urinated blood. Despite my best efforts to ward off dehydration it appeared that demon would steal my soul. I could not develop an appetite. My stomach felt heavy and bloated. The sun was intense over the forest. Please understand to my clouded mind none of this is embellished. And there was still so far to go. Others were experiencing the same maladies, I thought. They would have to. They are mortals as well. The halfway point arrived for me at dark. It was then the true spiritual expedition took place. Every aid station was a reprieve. I was alone on the trail. I sang my favorite song over and over until the words were a conversation bordering on madness. At mile 60 my urine was clear and that demon was gone only to be replaced by the ghoul of blisters. My feet were in tatters and every step was amplified by extreme exhaustion. 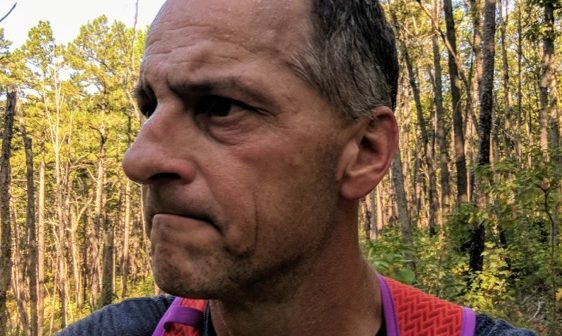 I realized my slow pace was going to challenge me to finish under the allotted time limit so I resisted the temptation to tarry long at aid stations, forcing myself onward. Sometime around 1 a.m. a young girl came up behind me on the trail moments after I switched songs to the Scorpions’ “Will You Send Me an Angel.” There she was. She even had the same name as my oldest daughter: Jessica. After talking with me for an hour or so she was gone, her company perhaps saving my life. Two hours later I arrived at the next aid station jokingly demanding whiskey. The woman in front of me immediately produced a bottle. I couldn’t believe it. I took the slightest sip to feel human. Then onward with encouragement from those volunteers. They are saints you see, put there by God to make sure you realize that you can do anything you set your mind to. As I moved slowly on my way I prayed that God would push me on. Later my prayer was that I be cradled. At mile 80 my pain was compounded by swelling in my left ankle, apparently for no reason. I had not rolled it. I guess that was a different demon. There was no cell reception so my family had no idea where I was. By then many had dropped and my heart bled for them because I understood perfectly well their commitment. At mile 85 I was told I was just under the cut off time. I had managed to create a strategy and understood full well my average pace would see me to the end in barely enough time. That was my goal, just to make it. I have never had any illusions about my abilities. I am an average runner with poor form and heavy legs and over time my body breaks down in a serious way. By mile 90 I was experiencing something akin to being at 25,000 feet on Everest. It was a mindset that is truly lonely. I thought I saw a yellow Volkswagen in the forest and then realized it was a sassafras tree. 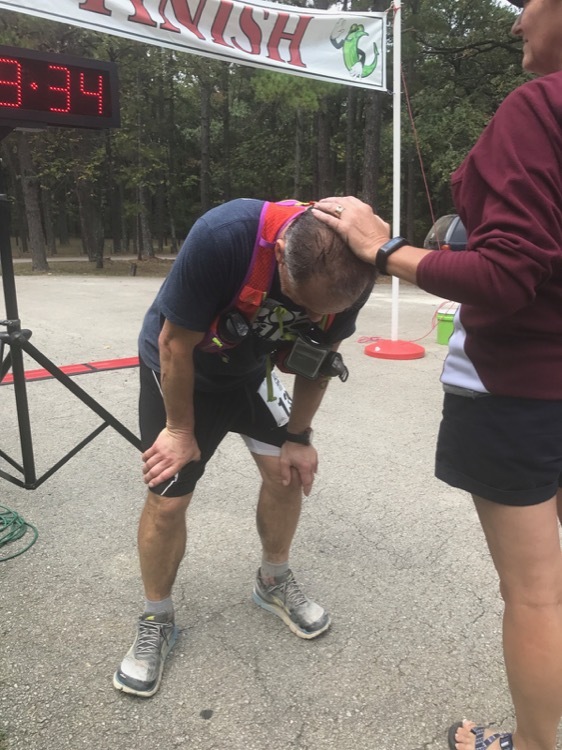 Several times through to mile 95 I heard voices: that of my wife, my mother, my brother, my children, and on the wind coming from somewhere beyond reality were the words of my own soul telling me that I was so close and yet so far from completing this insanity. Then at mile 95 around noon on Sunday I was told by lovely volunteers to stay upright, not to sit, to keep going and finish. A man offered to pace me and I gladly said yes. My feet were literally destroyed. The blisters were awful. My head throbbed. I was starting to quiver as if I was having tremors. The pacer smiled broadly and led me up the trail. He told me I was going to make it and strangely I realized he had been put there to cradle me. An answered prayer. Just after that I announced there was a monkey in the trail. The pacer ignored my hallucination and continued to encourage me. Gradually, oh so gradually, the trail came to me until the end appeared over a rise of pines and my wife and daughter were waiting. I weaved across the last 200 feet, pausing once to keep from falling. It was done. I collapsed in a chair. My daughter and wife held me. I looked away at the forest and saw something. It was my soul standing there waving back at me, whispering, well done, little brown-eyed boy who just had to know. Later I suffered extreme night sweats and could not sleep after 3 a.m. I sat up staring at the night through my window thinking of the people and images, and moreover of the accomplishment. My feet were swollen and tender. I could barely walk to my truck on Monday morning to go to work at the school where I am an administrator. I lost perhaps 12 pounds, though it felt like more. I am emotional and find myself crying over memories, songs, movies and the beauty of life. The ultra changes you; it enhances your DNA with something otherworldly. Awesome accomplishment. And I thought my first 100 was painful! Whoa man! One heck of a compelling story! Proud of you facing all kinds of demons! Nothing can stop you! It was my second actually. But brutal nonetheless. Thanks for the kind words. I’m ready to go again. A fantastic account truly written with blood, sweat, tears, and raw emotion. If anyone wants to know what is the essence of running an ultra…what it feels like physically and emotionally…it can be found here, in a read that was hours, days, and weeks in the making, yet takes only 5-10 minutes to complete. Congratulations on your great race and your post-race article! This is funny! And I’m so glad I found this because I was there when you finished and I heard you say: “I will never do this again, I will only work at aid stations from here on out.” So so happy to see you are already “ready to go again”!!! Congrats, You are a machine!!!!!!!!!! I think I may have developed an addiction to 100s. Great story man and congratulations!! Wonderful story !!! I thought I was reading about myself. I was trying to figure out why I took on an ultra for the first time. Thank you for putting into words, without over romanticizing both what you experienced, and why. You said it well. Very well. Congratulations Terry! We are all proud of you! “The ultra changes you; it enhances your DNA with something otherworldly.” Terry, now that’s an outstanding quote! Well done. TJ, I read and reread this post every day as I ponder my first ultra. Your poignant description of your journey is what I yearn for and what I fear. Thank you for such a heartfelt article.